Without a doubt one of the cleanest and strongest 3-ways on the market. Precision machined aluminum buttplate travels in and out, up and down, and rotates left and right on the in and out rod. Uses 3/16" allen wrench for all adjustments. Special clamping yoke secures the rod for no unwanted movement during shooting. Oversize base plate grinds down to fit most stocks. When you definitely know your proper LOP and weight is a factor, this 2-way has a base plate that can be ground to the stock. Can be made with 2 up/down set screws to allow maximum travel. This has a large enough base plate to be ground to fit most size stocks. This buttplate has up/down movement only. Used when the shooter knows their exact Length of Pull and requires some weight reduction. Comes with Pachmayer .450 rubber pad ground to fit. 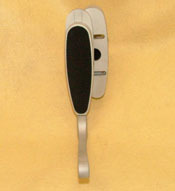 DV 4-way buttplate with hook that can be used for smallbore position shooting. This is a very clean, no hassle butthook system. Hook can be removed for use as a prone buttplate as well. Buttpad is flat allowing very good contact with the shoulder. Buttplate moves up/down, in/out and can also be cast off left and right like the standard DV Buttplate. 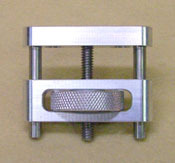 New MasterClass Turnwheel Cheekpiece, designed by Alex Sitman. The unit is made from high grade aluminum and the up/down rods are stainless steel with a stainless threaded center rod. The wheel runs on nylon washers and a spring washer to help keep the wheel running smoothly. The unit measures 2 1/2" by 1/2" wide and weighs a mere 3 1/2 ounces. The unit allows for more room for the in/out rod of adjustable buttplates on stocks with shorter lengths of pull. Just about any length desired can be incorporated into your stock. Specs: .750 wide, .360 deep, Top of slot .350 wide, bottom of slot .520 wide. One of the best trigger guards on the market. We use this trigger guard on a variety of rifles when a solid guard is needed to protect that expensive aftermarket or factory trigger. Used in many applications for Highpower Prone and Highpower Match Rifles. Used on a variety of rifles like the Stolle Pandas, RPA Quadlites, Nesika Bay, Banard and others. Available with various hole spacings to accomodate different actions.